Lip stains are generally pretty cack aren’t they? That Max Factor Lipfinity one? Cack with a capital C, it tastes revolting too. The Revlon Just Bitten version is only mildly more tolerable but horrendously drying on my lips. 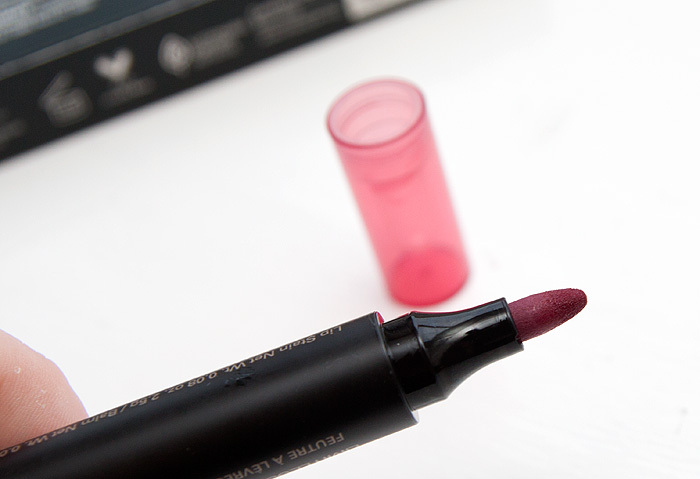 And so, it was with a certain amount of “here we go again…” that I took this Smashbox Limitless Lip Stain and Colour Seal Balm* away with me after a recent blogger event. My previous experiences were definitely playing heavily on my mind. 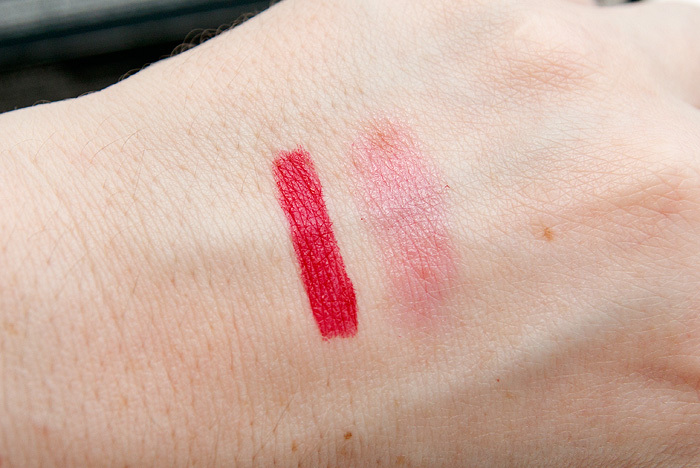 The Smashbox stain is a dual-ended affair with a liquid-dispensing felt tip on one end and a stick of balm on the other. The shade is Sangria, a bold wine-red… as you may have guessed from the name. The felt tip is the best I’ve used… it’s non-scratchy and dispenses an even amount of stain across the surface of my lips regardless of the angles I’m using to apply. These would probably go down really well in outer space for that reason alone. The other end offers a chunk of barely-coloured balm designed to match the stain in a hydrating formula. 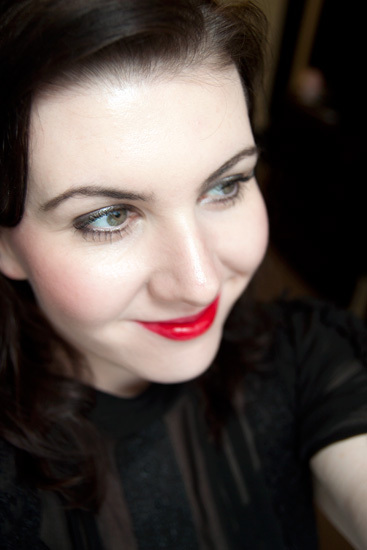 Some lip stains that I’ve used have had the tendency to be wishy-washy, needing many coats to build up the colour. 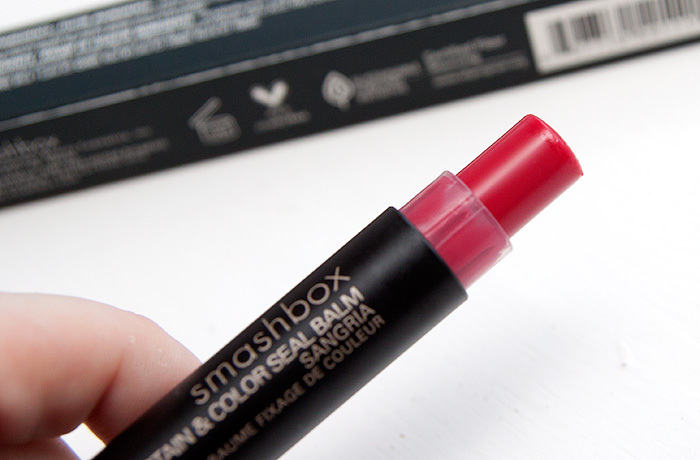 Not so here… the Smashbox Limitless Lip Stain and Colour Seal Balm in Sangria (I haven’t tried the other shades) is bold. Very bold. Vampy bold even. Unfortunately, it all starts to go a bit wrong from here. Once applied, I liked it a lot… infact I decided that I loved it. 2 hours in and the colour was holding fast without my lips being painfully dehydrated as a result. I had even decided that I would look past the £21.50 price tag for something that was such a WIN at being awesomely long-lasting and beautifully powerful. Then suddenly at around the 4hr mark, things went awry and the colour slipped VERY quickly. I should also point out that I hadn’t eaten anything (just sipped at the usual 56 cups of tea over the course of the morning). This is how it looked when I first applied it. Lovely innit? I was full of “OMG, I <3 Smashbox” at the time this photo was taken. Problem is that when this thing fades, it fades UGLY. Mr. L was adamant that I was bleeding from the mouth. It was looking not so hot after 4 hours but I left it another hour before taking the photo. I don’t want a lip colour that’s gonna scare the crap out of people around me. I don’t need that kind of hassle in my life and I don’t want people stopping me in the street asking if I need a paramedic. On the plus side, the Smashbox Limitless Lip Stain and Colour Seal Balm does not feather, isn’t horrendously drying and looks amaze when first applied. If you can remain no more than 4ft from a mirror at all times when wearing it for re-application checks, you’re gonna be in heaven. Me? I’m a bit scared of it. 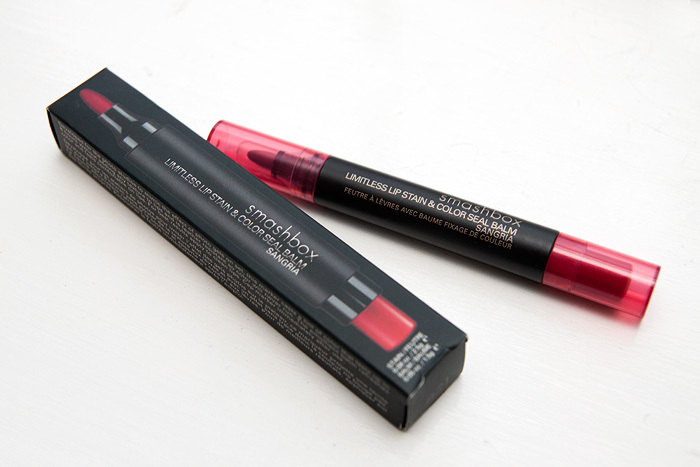 Smashbox Limitless Lip Stain and Colour Seal Balm is available in 6 shades and is priced at £21.50 from Debenhams. Maybe with the more “neutral” or less bold colors the fading won’t be so obvious? I still love you in red lipsticks! I was so disappointed that after 2 hours of doing nothing I had my lunch and it all disappeared! It’s meant to be a STAIN?! What’s that about? I’m not a huge fan of stains but the ones I have don’t fade like that. That’s terrible baring in mind the price. Can I just say that you look beyond gorgeous in that picture?! The vamp looks suits you perfectly! Shame that this stain doesn’t last so well, the colour is beautiful! Wow that’s amazing! It really does look like you’re bleeding–yuck! I have other stains and they have faded like that–makes you think the dreaded lip ‘ring’ isn’t so bad! I find this happens with pretty much all stains, I’ve tried Benetint and a Body Shop stain and I love to use them as lipstick bases, but if I wear them alone or with lip balm, I have to top them up every now and then. Yeah. I haven’t found a stain that doesn’t do this. Tried out the Revlon JustBittens and found they had the same result on me (but wouldn’t go on evenly to begin with.) Such a shame! I HATE stains. I would expect a lot more from that for the price though. That is so unfortunate! I have Guava and Cinnamon and haven’t experienced this during a full days wear. Guava lasted through a 12 hour day with no touch ups from the balm on me, plus my lips were chapped beyond reason before I applied. Maybe bad batch? That stinks that it faded like that cause I love these so much and was going to get the rest. Wow it started out so well! Your lips did look quite scary though when it faded! Do you think you’ll keep using it but keep reapplying or is it not worth risking looking like an extra from casualty? Forget the lipstain, where is that top from? I love the glimpse I’m seeing! eBay I’m afraid – I love victoriana type tops… but the high necklines always make me long for a more willowy frame! Aw that’s a shame! I’m trying to be more sophisticated (don’t laugh) and I adore tops like that, but I’ve never found one that’d suit me! Yours looked nice because of the mesh paneling. Oh well, the hunt goes on! Its shocking how it disappears after 4 hours :O I would be devasted! It looks great when first applied, but it really does look like you need medical attention after a few hours. The Max Factor one does this loo, it leaves your lips looking like you’ve been chewing on them a little too enthusiastically.